We celebrated my friend Vivian's daughter's first birthday at a Flushing seafood restaurant. I was tasked with the cake. Not able to find a bakery that would take an advanced cake order, I just made one myself. Vivian specifically instructed no nuts or chocolate. But I think we both had the same kind of cake in mind. 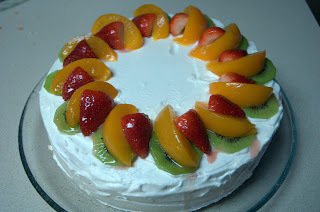 I think all Chinese/Taiwanese kids around my age (umm I won't reveal the actual number here) would recall this kind of birthday cakes from our childhood -- layers of light yellow sponge cake and snowy white whipped cream mixed with various fruit chunks. The cake is usually plainly frosted with the same kind of whipped cream, and topped with more fruits -- but what is common to all these cakes are slices of canned yellow peaches 水蜜桃! To this day, canned peaches are still a guilty pleasure of mine. When I was little, I always begged my mom to get a can of peaches if I tagged along with her to the western-style supermarket. Other than the peaches, I still used fresh fruits -- fresh strawberries, kiwis, and d'Anjou pears. I only had a slight worry about the frosting -- unlike buttercream, which holds its shape incredibly well, whipped cream is not all that stable. Thankfully I found a recipe of stabilized whipped cream in the Joy of Cooking -- simply mix 1 Tbsp water with 1 tsp gelatin; let it dissolve into a clear mixture in a simmering waterbath; after it has cooled to room temp, mix it into 1 cup of heavy cream as it is being whipped. The sponge cake recipe is from Julia Child's book Mastering the Art of French Cooking. I made this recipe twice to have two thick layers. Two cups of heavy cream and ~3 cups of fruit chunks were enough to fill and frost the cake. I made a variation by adding lime zests to the yolk-sugar mixture. 1. Cut out parchment paper to fit a 9" spring form pan. Butter the pan and parchment paper. With the paper stuck on the bottom of the pan, coat the pan and paper with flour. Turn the oven to 350F. 2. Beat egg yolks with 2/3 cup sugar and vanilla until pale yellow and ribbony. 4. Sift 1/4 of all the flour and 1/4 of the beaten egg white into the yolk mixture. Fold until partially incorporated. Repeat with 1/3 of the remaining whites and flour until partially incorporated. Repeat again with 1/2 of the remaining whites and flour until partially incorporated. 5. Fold in the rest of the flour and whites and half of the melted butter until partially incorporated. Pour in the rest of the butter and fold to incorporate. 5. Pour batter into the pan and bake for 30-35 min until a cake tester from the cake center comes out clean. Let the cake cool in the pan on a rack for 6 minutes. Remove the cake and cool completely on the rack. It was the taste of my childhood memories! Did Shanghainese kids have similar kind of cakes? 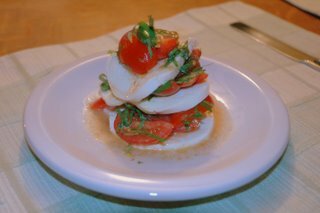 and btw, you sounded like Rachel Ray (Yummo!) haha! Yes, same exact cake in Shanghai too, or at least similar, it was hard to get used to the heavy butter cream in the US when I first got here when I was used to the light whipped cream in Shanghai on cakes.